What conditions does Zonegran treat? Tell your doctor right away if you have any unlikely but serious side effects, including: mental/mood problems (such as confusion, difficulty concentrating, memory problems, agitation, irritability), speech problems, decreased sweating, sudden back/side/abdominal pain, painful urination. Get medical help right away if you have any very serious side effects, such as: easy bruising/bleeding, signs of kidney problems (such as change in the amount of urine, pink/bloody urine), signs of liver problems (such as nausea/vomiting that doesn't stop, loss of appetite, stomach/abdominal pain, yellowing eyes/skin, dark urine). List Zonegran side effects by likelihood and severity. What should I know regarding pregnancy, nursing and administering Zonegran to children or the elderly? Some products that may interact with this drug include: carbonic anhydrase inhibitors (such as acetazolamide), orlistat. Does Zonegran interact with other medications? 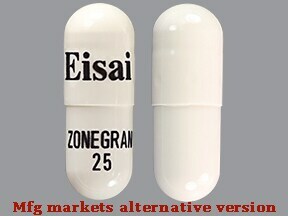 This medicine is a white, oblong, capsule imprinted with "Eisai" and "ZONEGRAN 25". 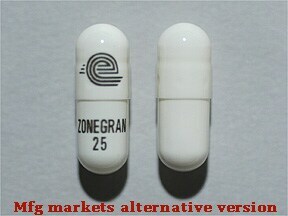 This medicine is a white, oblong, capsule imprinted with "logo" and "ZONEGRAN 25". 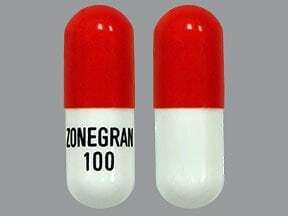 This medicine is a red white, oblong, gelatin coated, capsule imprinted with "ZONEGRAN 100". Are you considering switching to Zonegran? How long have you been taking Zonegran?